Oncology Clinic "LISSOD" in the section "Oncology"
In the section "Oncology" had participated main doctors and leading specialists of private clinics from Kiev, representatives of the medical facilities from Turkey and Kazakhstan. With the actual report, interested audience, was the LISSOD's Deputy Head Doctor of Surgery, Sergei Baido. In the first part of the report "The unique advantages of a private oncology medical tourism" famous laparoscopy surgeon focused on the formation and development of the hospital, the vital role of clinical oncologists and the importance of decisions taken by the council of different profiles physicians according to international protocols. 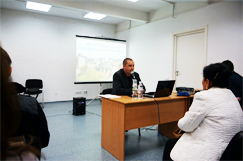 "In LISSOD exactly copied the Western approach to the treatment of oncological diseases," - said Sergey Baido. Making a a quality comparative analysis of the current private and public medicine, he noted the paradoxical situation where state medicine has ceased to be in fact. The second part of the report of the Deputy Head Doctor has dedicated advantages of laparoscopic techniques in cancer surgery. He spoke about the history of laparoscopy, a prominent experts in this field. Sergei Baido debunked the myths that are sometimes used by doctors who do not know minimally invasive techniques to persuade the patient to the traumatic "open" surgery. There was information in the report about NOTES-surgery that uses natural orifices of the body to remove the tumor or diseased organ. "Minimizing injury - this is tending modern surgery", - concluded by the applause Sergei Baido.